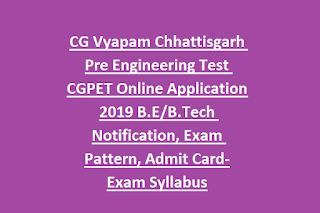 CG Vyapam CGPET Online Application 2019, Exam Syllabus: Chhattisgarh Vyavsayik Pariksha Mandal released a new notification for the admissions in to B.E/B.Tech Engineering Technology, Agriculture Technology, Dairy Technology courses through CG Pre Engineering Test CGPET 2019. Online Application form for this CGPET 2019 will be available from 19-03-2019 to 07-04-2019. CG Pre Engineering Test will be held on 02-05-2019. Intermediate qualified or 12th passed candidates are eligible for this CGPET Online Application form submission. CGPET Exam covers the topics of 10+2 level Maths, Physics and Chemistry. CG Pre Engineering Test admit card, eligibility criteria, exam pattern and syllabus and other details are updated below. Chhattisgarh state candidates are eligible to apply online for this CGPET 2019. Intermediate or HSC qualified candidates are eligible to apply for this CG Pre Engineering Test 2019. Only those candidates who studied Maths, Physics, Chemistry subjects they are only eligible to apply online for this CG Vyapam CGPET 2019. Must have 45% marks for General candidates and for SC/ST/OBC/PH candidates 40% marks are required to apply online. CGPET 2019 exam will be conducted in all the district head quarters of Chhattisgarh state. CGPET 2019 Exam pattern will be conducted for 150 marks. Total 150 questions will be given. Exam Syllabus is Intermediate level for this CG Pre Engineering Test 2019. Candidates who are looking to study in Engineering Technology, Agriculture Technology, Dairy Technology courses they can apply online for this CGPET 2019. Admit Card for this CG Pre Engineering Test will be available 7 days before the exam date. Admit Card link will be updated in this page soon. To download admit card candidates must have registration id and password. 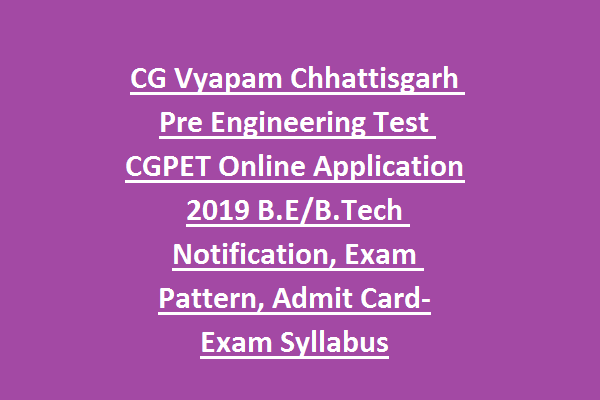 Before downloading please check all the details and then download admit card for this CG Pre Engineering Test 2019. After the result of CG Pre Engineering Test candidates are called for counseling based on rank in CGPET. At the time of counseling candidates must have produced the all original documents.